The GE Lightspeed 16 mobile CT scanner is one of our most popular and best-selling used CT Scanners, and its price for performance is among the top of 16-slice CT scanners across the industry. The GE Lightspeed mobile CT scanner features sub-millimeter slices, routine 16-slice coverage, 4th evolution technology, GE microVoxel technology, 3D image quality, and high-resolution imaging. The data acquisition technology of this mobile CT has been upgraded to record 16 channels of data simultaneously. Additionally, the Lightspeed 16 can provide both 3D and 4D and display multiple images simultaneously. The GE Lightspeed 16 mobile CT is available in two separate versions, the GE Lightspeed Pro 16 and the GE Lightspeed 16. The Lightspeed Pro has a different X-Ray Tube (Performix Pro), generator and gantry, which allows for higher mA techniques and faster scan times than the standard GE Lightspeed 16-slice CT scanner. The Pro has a higher Anode heat capacity at 7.5-8 MHU depending on the model. 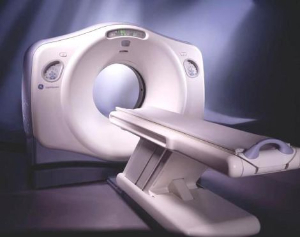 This remains one of our most popular and sought-after CT scanners on the market. Customers like it for cancer detection, its ease-of-use, and excellent image quality in 2D and 3D.